The SONIMAGE MX1’s high sensitivity & wide band linear probe features advancements in transducer design such as a multi acoustic matching layers, optimized properties of various component materials, and nanofabrication technology. The L11-3 probe is a balance designed between wide band and sensitivity so as to provide adequate resolution and penetration at depth. 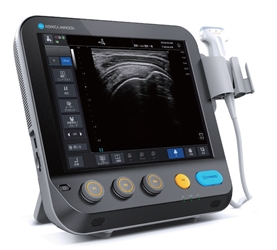 The SONIMAGE MX1 incorporates an emphasis algorithm that utilizes both the in-plane and out-plane method techniques to improve needle visibility, especially in steep angle approaches. This Simple Needle Visualization provides safer and more efficient procedures. 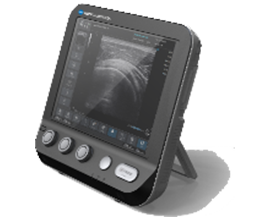 The user interface of the SONIMAGE MX1 is a full-featured touchscreen control panel designed to be intuitively understood even by beginners. Customizable touchscreen with the five most frequently used keys allows you to facilitate superior workflow and improve efficiency and throughput. 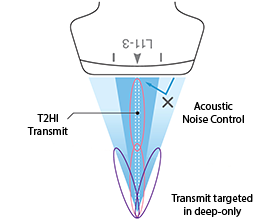 Konica Minolta uses a unique transmitting control algorithm to transmit two waveform regions selectively according to focus depth. As a result, the system can improve penetration, resolution, uniformity & S / N for optimum image. Compare View is a function to call up and show previous study data (still image / clip) during an examination. 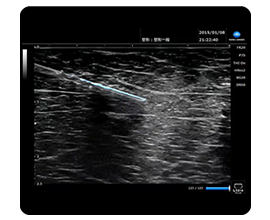 During an examination, the current ultrasound image can be compared with previous study data. Cradle, a mounting platform for MX1, allows you to hand-carry the system without insertion and removal of AC power/USB cable. It can be mounted on the cart with VESA and the platform also enables the user to charge the battery once the system is put back. The additional battery, when mounted, allows one to use the MX1 for a continuous 2-hours. 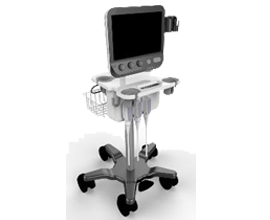 Battery operation is just one of the features that makes it easy and quick to set up in the perioperative, rehabilitation and other environments. Gain Control: Overall Gain Control, 8 - Step TGC continuously adjustable. Cine Loop: Prospective as well as Retrospective storage available. Image Storage: Internal storage device of SSD (Solid State Drive) available. ©2017 Konica Minolta Healthcare India Pvt. Ltd.